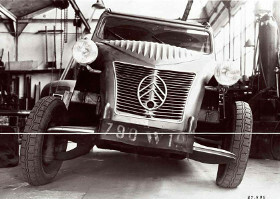 When the 2 CV was first developed it used 400mm wheels and fitted 125SR400 Michelin X tyres. Then in 1960 Citroen changed to 15" wheels and fitted 125SR15 Michelin X tyres. There still isn't a better tyre for these cars. 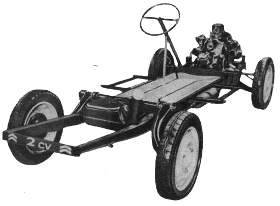 The design of the X carcass is an integral part of the design of the 2CV chassis. From 1949 to 1960 Citroen fitted a 125R400 Michelin X to their early Deux Chevaux. From 1960 the 2CV fitted a 125x380 Michelin X. This description has the rim diameter described as 380mm; today the rim is described in inches; so the 125R15 Michelin X is the correct tyre. Fitting the correct Michelin X 125R15 to the Deux Chevaux is absolutely critical; the carcase structure is like nothing else and combined with the square shouldered thin tread is an important part of the cars suspention and steering geometry. The 2CV and Michelin X 125R15 tyres were developed to work together. Michelin also make a 135SR15 Michelin X M+S (Mud and Snow) tyre. For normal road use Michelin also make a 135SR15 Michelin ZX. However 135 and ZX are not right on the car, with too much foot print a tall carcase with a tread pattern that is the wrong shape. Citroens 2 CV need the 125R15 X. In Spain the the standard equipment for a 2cv was a 135x15 Michelin ZX. Click here to see the options available for your Citroen 2cv. The 135SR15 Michelin ZX was also fitted to the Citroen Ami. There are a variety of cheap 2CV Citroen Tyres available. How ever these tyres are nowhere near the quality of the Michelin 2CV Citroen. Also when the 2CV was made it was designed to fit the Michelin X by Citroen while they were owned by Michelin.